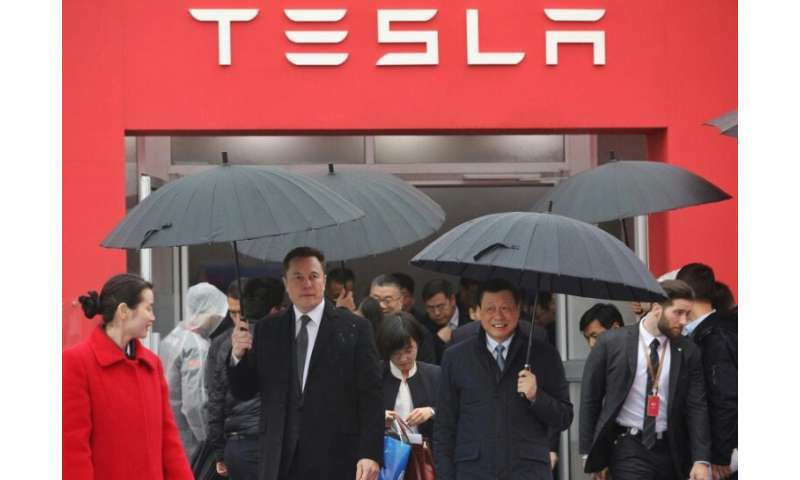 Electric carmaker Tesla has won more than $520 million in loans from Chinese banks to build its first overseas car plant near Shanghai, the first foreign automaker to wholly own a factory in China. The funding, announced on Thursday, is an important boost for the California-based firm, which has been in negotiations with Beijing for years over building the plant in the world's biggest electric car market. The US giant will make its Model 3 sedans at the factory—initially targeting 3,000 cars a week before ramping up annual production to 500,000—which it plans to have operational by the end of the year. According to a regulatory filing, Tesla has secured $521 million from four domestic banks—the Industrial & Commercial Bank of China, the Chinese Construction Bank, Agricultural Bank of China, and the Shanghai Pudong Development Bank. China is by far the world's biggest car market and sales there have been on an upwards trajectory for years, although they slipped 2.8 percent in 2018. Sales of electric vehicles and hybrids have meanwhile continued to swell—jumping 62 percent last year—but only make up just four percent of overall sales in China. Tesla remains in the lead, but is followed by three Chinese brands—BAIC, BYD and Zotye—according to analysis provider Jato Dynamics. Can you imagine electric cars in China? Hours, days long traffic jams with car batteries running dead, at a standstill. Can you imagine electric cars in China? Erm, hello? China has the largest number of EVs of any country (sales last year almost scratched the 1 million mark and a further quarter million plug-in hybrids on top of that). About every second electric/hybrid card sold in the world is bought in China. Chinese manufacturers also build the most electric vehicles on the planet. By quite a huge margin. Hours, days long traffic jams with car batteries running dead, at a standstill. If you're in a traffic jam you *want* an electric cars as opposed to a combustion engine - because it produces neither noise nor pollution nor does it run out while standing still.